LICENCE TO FUNK is the eighth album by the Nils Landgren Funk Unit, and again, the Swedish trombonist reconfigures the band's personnel to keep things fresh. He keeps the rhythm section of German drummer Wolfgang Haffner and bassist Magnum Coltrane Price and adds reedman Magnus Lindgren, keyboardist and vocalist Ida Sand, and -- the biggest surprise here -- Detroit guitarist Ray Parker, Jr., author of the hit single "Ghostbusters," who had retired from music in the early '90s and then reappeared on Landgren's collaboration with pianist Joe Sample, CREOLE LOVE CALL, in 2005. After the previous record's experimentation with ABBA tunes (FUNKY ABBA), LICENCE TO FUNK is basically an homage to various types of old-school '70s funk: the dry, hard-edged funk of James Brown's famous rhythm section is celebrated in an energetic cover of Fred Wesley's "House Party," another cover brings back the bouncy disco-funk of the Ashford & Simpson/Quincy Jones classic "Stuff Like That," and there are several nods toward the smooth soul-funk of the Crusaders -- for example, Landgren's own composition "24Hours," with its soft electric piano, relaxed background vocals, and sweet flute melody, or his near-instrumental "Capetown Shuffle" (not to mention a cover of Crusaders bassist Wilton Felder's "Brazos River Breakdown"). Despite the three cover tunes and the large number of comparisons the music brings to mind, LICENCE TO FUNK is neither a full retro album nor a slavish imitation of all those acts -- the Funk Unit is in top form, with tightly locked grooves and inspired soloing, and the record is an excellent showcase for a band that knows how to use a funk rhythm as a springboard to exciting interplay. While all of the musicians are great (and all, except for Lindgren, contribute original songs), Ray Parker, Jr.'s presence is what gives the group that something extra: listening to his opening guitar licks on "Freak U" and the bluesy "Secret" alone makes you glad he's back. The two songs he's written are among the album's highlights: the gritty, driving rhythm of "SampleRayT" inspires some soulful soloing by saxman Magnus Lindgren, and Parker even sings in his instantly recognizable voice on "For Those Who Like to Party." 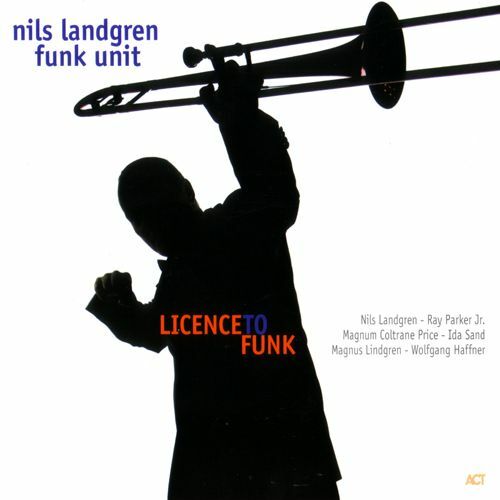 If the Nils Landgren Funk Unit continue to record albums this good, their title-giving licence will never be revoked. This review was written for the All-Music Guide on September 28, 2007.